Maybe what we all need is a reading challenge. 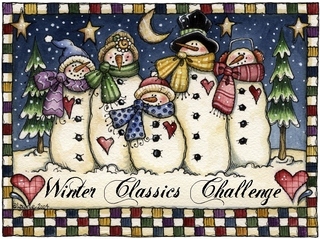 On Lotus Reads' blog I came across the 2007 Winter Classics Challenge which she picked up from booklogged's blog. The challenge is to read five classics during the months of January and February. What kind of books might be considered classics I guess opens up a whole can of worms. One I would like to open another day, actually. But I guess most useful criteria is whether a book has withstood the test of time. Pick 12 books - one for each month of 2007 - that you've been wanting to read (have been on your "To Be Read" list) for 6 months or longer, but haven't gotten around to. Then, starting January 1, 2007, read one of these books from your list each month, ending December 31, 2007. So yes, I will do this challenge. The great thing about such challenges is that they make you read the stuff you've been neglecting. And that happens far too often these days as new books get hyped and you feel you're being left behind by the floods of highly acclaimed new stuff on the award lists, best-seller lists, best-books-of-the-year lists and piled high and temptingly in the bookshops. You feel you're not part of the conversation if you're reading something even a little older. Maybe you could suggest some other reading challenges. And maybe, just maybe, we could set up our own challenge? I'm a dummy. Why don't we have a banned book reading challenge? I can't count, can I? I was supposed to list 12 books and I only listed 6. Duh! Your idea of reading banned books is excellent! Howz about the book-club doing an inventory of all the banned books in our possession, bring it for one of our gatherings,each one selects a book from the pile, reads it and at one of the meets later in the year we meet up and everyone gives a mini-review of their "hot pick"? We'll call it Fiction&Friends:The Banned Sessions. I've not yet made a decision on which books that I want to read, but for 2007, I'm planning to put up a list of 30 "to be read" books and write a short review in the same style as Eyeris' as proof that I've read the books as well as writing short notes and little thoughts about the books. Besides that, one of my New Year resolutions is to make an attempt to attend the Seksan readings and organise a couple of writing meets!! Don't know how you guys have the time.. I've only managed to finish one book since the Times book fair, and now I'm still stuck in Rob Roy. But then again it's a great book. That's what's good about the classics, they're very layered. They make lots of references to lots of other stuff, it's fun to re-read it, you pick up references you didn't notice before. Anyway I have definitely got to start the blog. i enjoyed the little friend a lot, sharon, and was even considering a reread this year (too late!) but i enjoyed her first book even more; it's called the secret history and i suppose it ranks as one of my all-time favourite books. i read money recently and it was thoroughly disturbing and amusing, a very discomfiting mix, but then that seems to be the amis style. I'll see if I can finish Ashok K. Banker's version of the Ramayana. Of course I know the whole story, but what the heck... .
One book that has been on my "must read" list forever is Middlemarch by George Eliot. I think it'll be my book challenge for 2007. For sure I can't finish it in a month, so maybe a Middlemarch chapter a month every month of 2007? sufian - impressive list. which would you nominate as the best? (and are you going to post your suggestions on the world without borders website? mizb - and thank you for the excellent suggestion! kaykay - how did you manage to accumulate such big big books? the banned books for the book club is a good idea! subashini - yes, i want to read both books but i'll start with the second because i have such a pretty hardback copy of it. greenbottle - that you're going to read or that you recommend? zarina - i've been meaning to read this book for yonks. i'm sure i will enjoy it. if i have time i will try to read other bonus tbr books. i dare not tell you how many i have or how the number is growing. heard about this reading challenge thing from Fei. well it sounds interesting and i certainly have dozens of must-read-but-havent-read books on my shelves! let me compile my list this weekend. 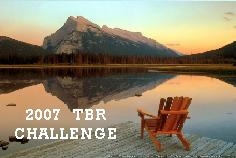 I posted the TBR challenge on my blog, for my chinese language friends. 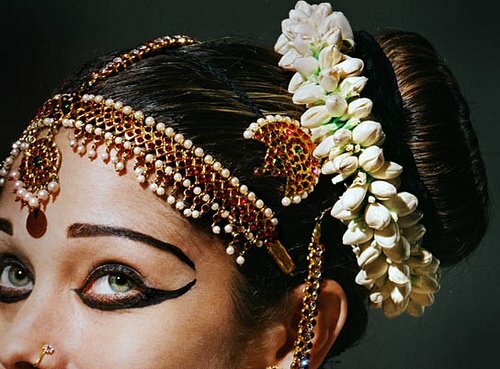 It's... the Ramayana. The version I'm reading now comes in six volumes and is available in most major bookstores under their SciFi/Fantasy sections. The author's retired blog is here. The re-telling looks more modern to my untrained eyes. I think he's trying a bit too hard (but not as much as L.E Modesitt when explaining his Recluce theories). thanks joshua - yes, i picked up "kiss of the spider woman" in raman's shop and thought it looked very interesting ... and i remembered there had been a critically acclaimed film. your recommendation makes me feel i made a good choice. I wonder which book we have in common. My fren Joshua was sugesting we should accept the Banned book challenge too. I was telling him the banned book i had is Salman Rushdie's Salimar the Clown. We plan to start our reading club next year, hopefully we can attract some of our chinese-reading friends to join us. Speaking of what chinese-reading frens read, we read chinese writer's work, and also chinese translated fiction and non-fiction imported from Taiwan and China. sufian - thanks. think i have to read more by keret now. yes, i think it looks like the banned books reading challenge is one we should get off the ground! and fei, let us know about chinese novels you come across that are especially good, partic. if translated into english! hmm...we might have the similar taste...I like Ishiguro's never let me go, but a friend told me, remains of the day is his best work so far...I knew I'll enjoy it. Great list, Sharon! I look forward to reading your thoughts on the books you read for the challenge. Good luck to you!